Paʻa Pono Miloli’i Inc. a community formed 501 (c)(3) incorporated for the purpose to preserve and protect the cultural, historical, environmental and arachaeological life and heritage within the ahupuaʻa of Hoʻokena, Pāpā, Hoʻōpūloa, Miloliʻi, Omokaʻa, Kalihi, Honomalino, Okoe and Kapuʻa. 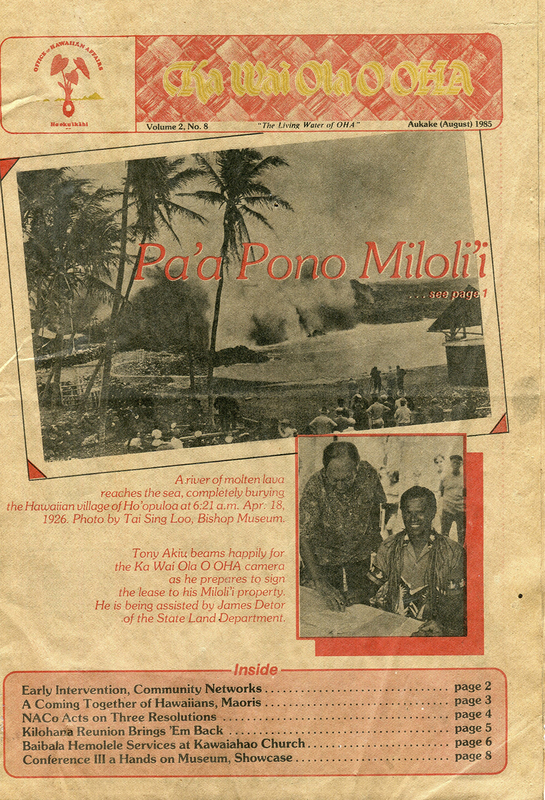 Paʻa Pono Miloliʻi was first formed in 1980 (and formally incorporated in 1983), as Paʻa Pono Miloliʻi Inc. to improve the quality of life for the residents of the “Last Hawaiian Fishing Village in the State of Hawaiʻi”. Among Pa’a Pono Miloli’i’s first major efforts was to create a Master Plan for the community that focused on supporting residents to secure land rights and build safe affordable homes in the village. Working directly with OHA, DLNR, and the Legislative and Executive branches of the State of Hawai’i, Act 62 was passed in 1984 which provided homes to the descendants of the 1926 Hoʻōpūloa lava flow from Mauna Loa which destroyed the fishing village of Hoʻōpūloa. Building on the great success of this effort, Pa’a Pono Miloli’i Inc. has carried out numerous community projects over the years. One of its earliest accomplishments was the short film documentary “The Song of South Kona” released in 1986 and created with support from the State Foundation on Culture and the Arts. The 30 minute documentary directed by Volcano resident Boone Morrison chronicled Miloliiʻs residents and their unique lifestyle as a native Hawaiian fishing village caught between their rich and storied past and a rapidly changing world around them. Pa’a Pono Miloli’i Inc. was granted non-profit 501(c)(3) status by the Internal Revenue Service in 2004 and continues its mission to improve the lives of the residents of the South Kona fishing village. Today Paʻa Pono Miloliʻi Inc. is dedicated to supporting Miloli’i residents to improve the quality of their lives through environmental marine sustainability, youth education, and enhancing cultural practice.